Does the First Amendment bar public officials from blocking people on social media because of their viewpoint? That question has hung over the White House ever since Donald Trump assumed the presidency and continued to block users on Twitter. The Knight First Amendment Institute at Columbia University has sued the president on behalf of blocked users, spurring a lively academic debate on the topic. But Trump isn’t the only politician who has blocked people on social media. This week, a federal court weighed in on the question in a case with obvious parallels to Trump’s. It determined that the First Amendment’s Free Speech Clause does indeed prohibit officeholders from blocking social media users on the basis of their views. Defendant’s offense at Plaintiff’s views was therefore an illegitimate basis for her actions—particularly given that Plaintiff earned Defendant’s ire by criticizing the County government. Indeed, the suppression of critical commentary regarding elected officials is the quintessential form of viewpoint discrimination against which the First Amendment guards. By prohibiting Plaintiff from participating in her online forum because she took offense at his claim that her colleagues in the County government had acted unethically, Defendant committed a cardinal sin under the First Amendment. The lawsuit against Mr. Trump in federal court in Manhattan was brought by the Knight First Amendment Institute at Columbia University on behalf of seven users whom Mr. Trump blocked. “We hope the courts look to this opinion as a road map in holding that it is unconstitutional for President Trump to block his critics on Twitter,” said Alex Abdo, senior staff attorney at the institute. The White House didn’t immediately respond to a request for comment. There’s just one lingering issue with this comparison: It isn’t clear whether Trump intends his personal Twitter page to function as a public forum the way Randall did. 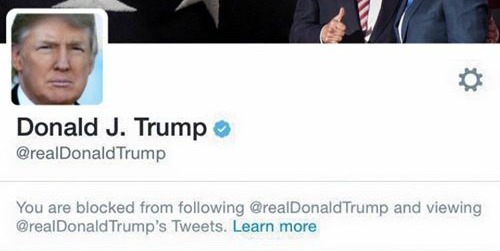 (Trump has a presidential account, @POTUS, from which he does not block users—but he doesn’t use it for interesting communications.) Public officials have more latitude to censor expression in personal, private forums than they do in forums that they use to speak in their official capacity. Trump’s lawyers will almost certainly argue that his personal Twitter feed is a private forum, not a government project. But that argument will likely fail. As Trump’s recent tweets banning transgender military service demonstrate, the president uses Twitter not just to convey official policy but also for lawmaking. This habit would seem to turn his feed into a quintessential public forum. And so, under the First Amendment, he lacks the power to block those users who tweet their discontent at @realDonaldTrump.